Since the dataset is too big for Github, I uploaded it to Google Drive. Download the file and unzip it in a folder. You should see two directories, train and test. The first directory contains 2,500 images of each category while the test directory has about 1,500 images. With the container up and running, we can access the web UI at port 5000. 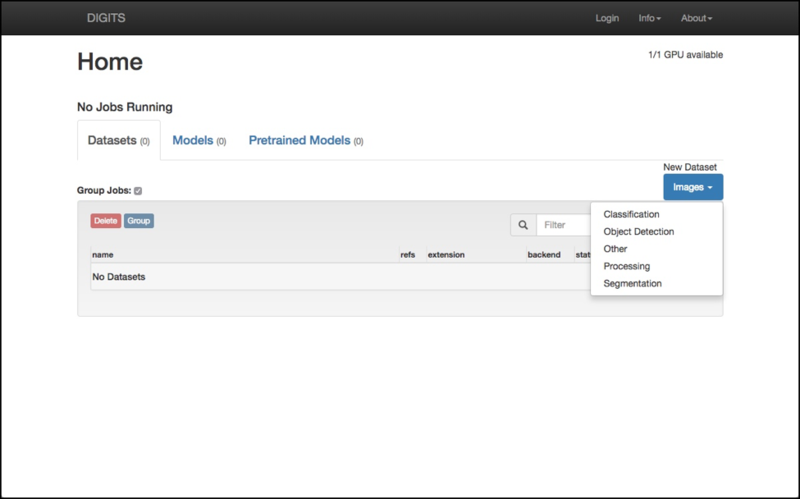 Click on the Datasets tab, and choose Classification. Point DIGITS to the train and test directories. 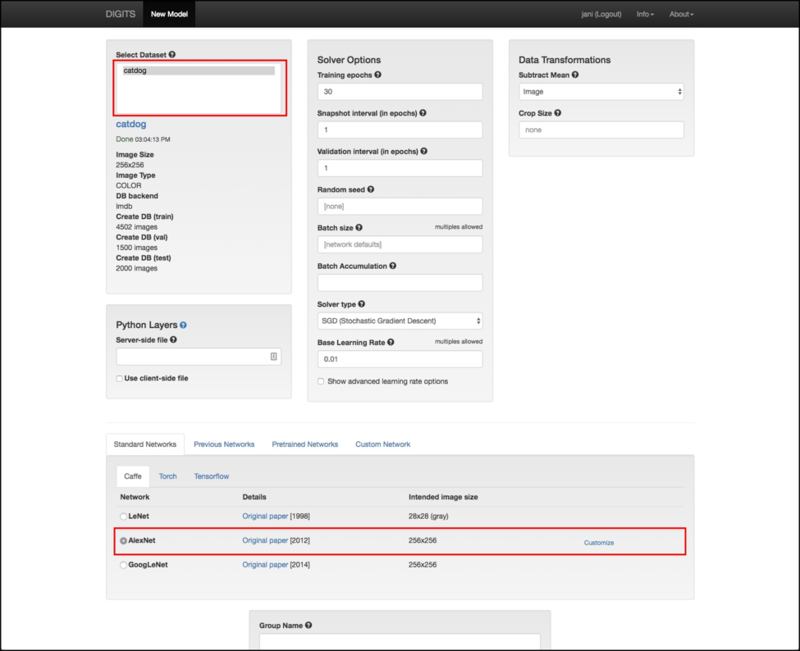 Give a name to the dataset and click Create. Within a few minutes, DIGITS will parse the directories to create three databases — train, val, and test. 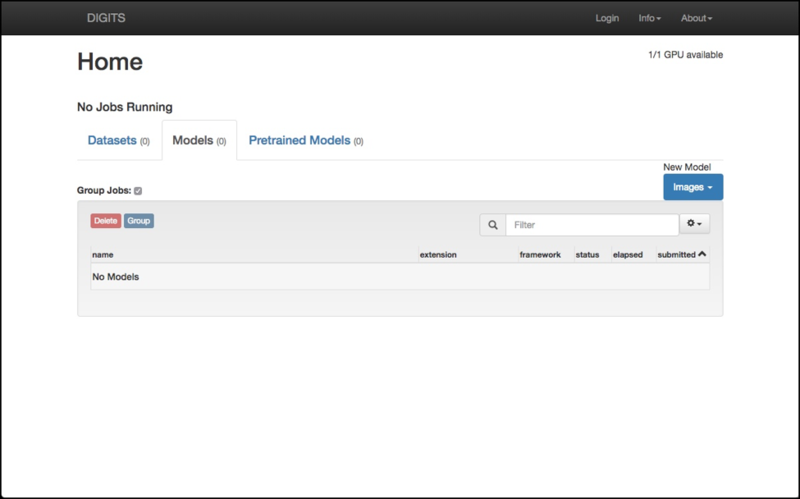 Go back to the home page and select the Models tab. Under Images drop-down, select Classification. Choose the dataset created in the previous step. Under Standard Networks, make sure you select AlexNet. Give a name to the model and click Create. The above step kicks off the training job, which will take a few minutes to complete. You will notice that the accuracy increases with each epoch. 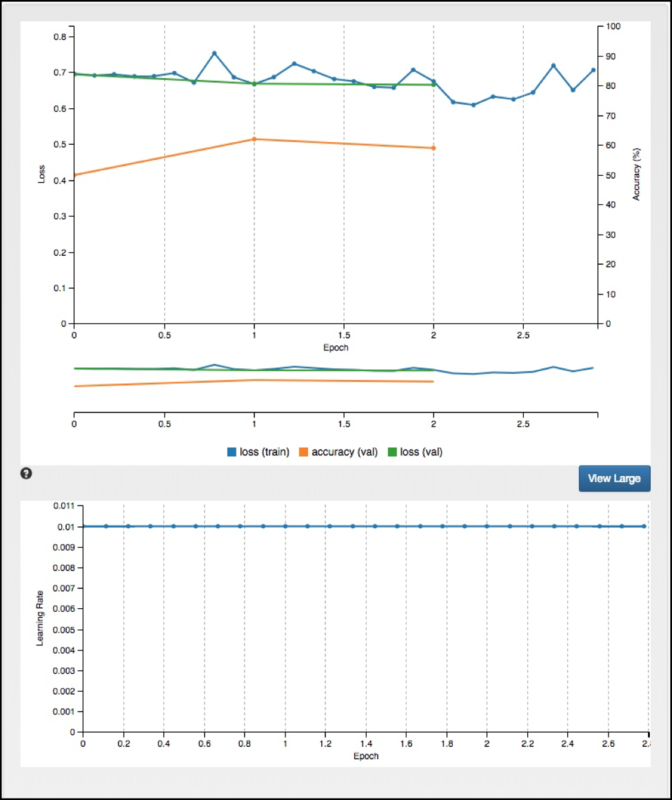 Also, the learning rate gets adjusted with each epoch. By the time it hits the 30th epoch, the model reaches an accuracy of 85 percent. Let’s test our trained model with a cat and dog image from the web. 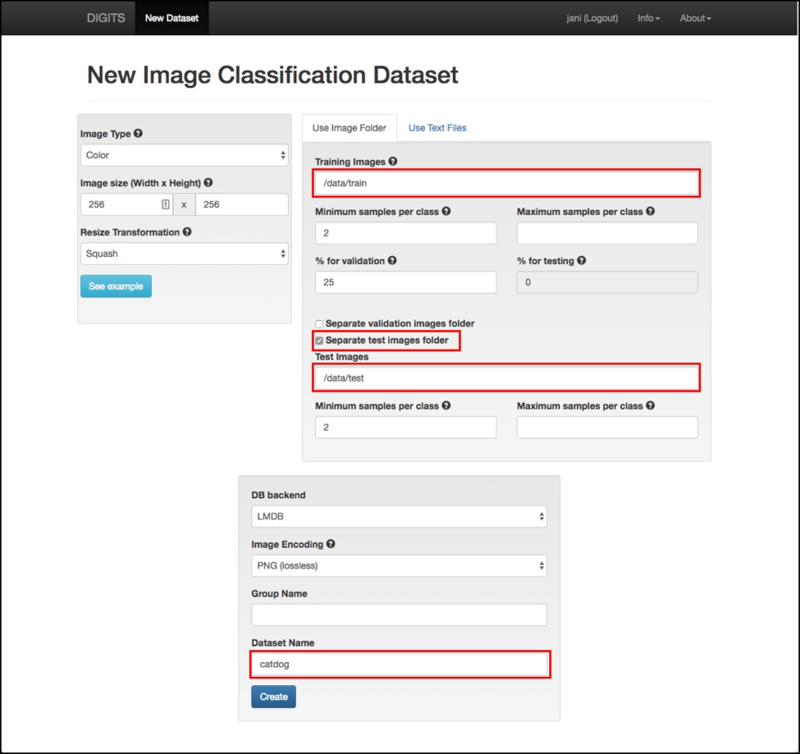 Under Trained Models, browse for an image, and click on Classify One. Our model should accurately classify dogs vs. cats. Congratulations! You have successfully built a CNN model without writing a single line of code. In the next step, we will use the trained model for inferencing. Let’s run the trained model on our local machine. 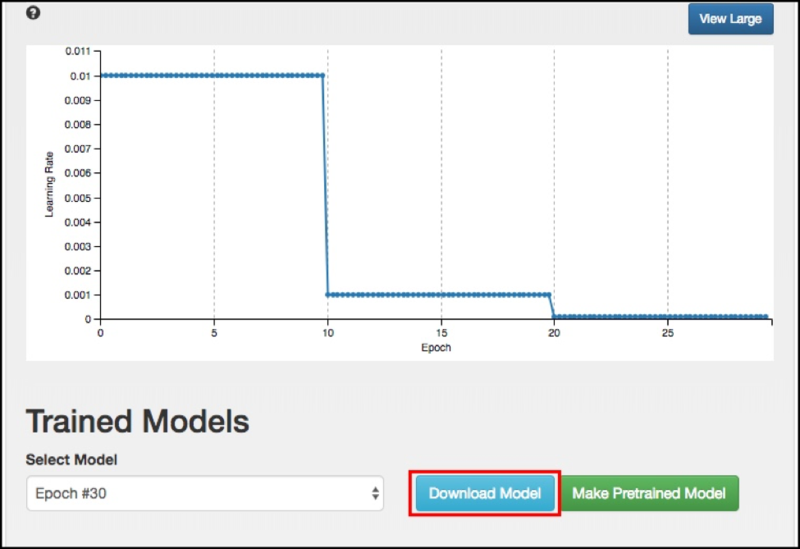 Click on the Download Model button, which will start downloading the compressed model along with the weights. 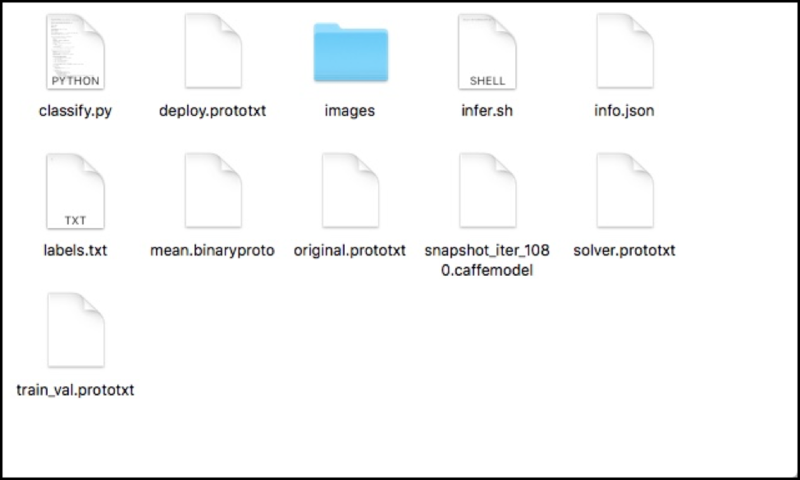 Clone this repo which contains Python code for classification along with the shell script to run the Caffe Docker container for inference. It also contains a few sample images for testing the model. Uncompress the downloaded model and copy all the files from the inference directory of the cloned repo. Your directory should look similar to the below screenshot. Set the environment variable to the Caffe model file, and then run infer.sh script to perform inference. This command will pull the Caffe Docker image for the CPU on the local machine. $ bash infer.sh images/1.jpg Unable to find image 'bvlc/caffe:cpu' locally cpu: Pulling from bvlc/caffe 22dc81ace0ea: Pull complete 1a8b3c87dba3: Pull complete 91390a1c435a: Pull complete 07844b14977e: Pull complete b78396653dae: Pull complete efebd366640a: Pull complete 4e325e9a951a: Pull complete 384c8a5cd8c4: Pull complete 0df2c13a8aa1: Pull complete 41474c5b537e: Pull complete Digest: sha256:1dd685def250ef965599c2794508aeddf8c4b91447c2e923ac0bf5e8ecf2a499 Status: Downloaded newer image for bvlc/caffe:cpu Processed 1/1 images in 0.344489 seconds ... ------------------------- Prediction for images/1.jpg -------------------------- 78.1073% - "dog" 21.8927% - "cat" Script took 1.915341 seconds. $ bash infer.sh images/3.jpg Processed 1/1 images in 0.329652 seconds ... ------------------------- Prediction for images/3.jpg -------------------------- 90.1773% - "cat" 9.8227% - "dog" Script took 1.849655 seconds. docker run -it --rm --name caffe -v $PWD:/infer bvlc/caffe:cpu bash -c "cd /infer &amp;&amp; python -W ignore classify.py -m mean.binaryproto -l labels.txt $MODEL_NAME deploy.prototxt $1 --nogpu"
The script essentially maps the current directory with the model and weights inside the Caffe container. It then invokes classify.py with appropriate parameters such as the model name, weights, labels, and the image to be classified. Since the container has the Caffe framework and all other dependencies, it can execute classify.py to run inference. 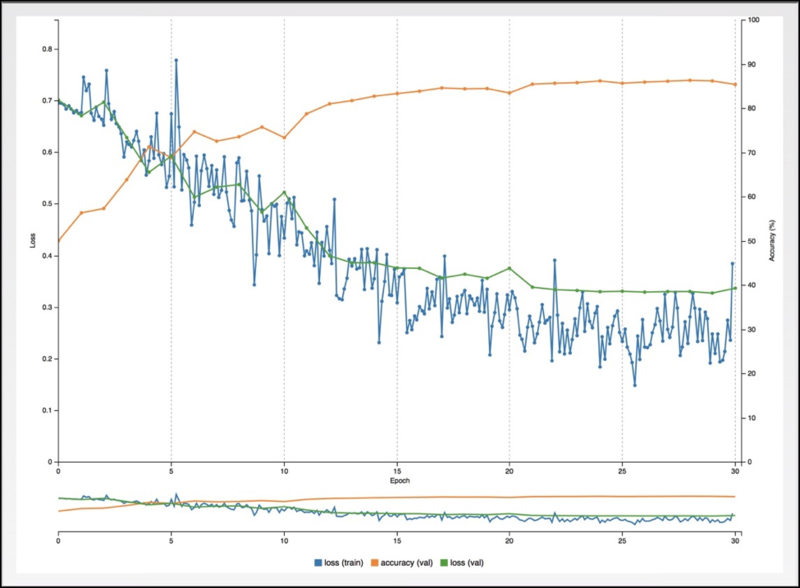 This tutorial covered the workflow involved in training a model through Nvidia DIGITS running on a Linux machine backed by GPU and using the same model on a Mac or Windows machine for inference. 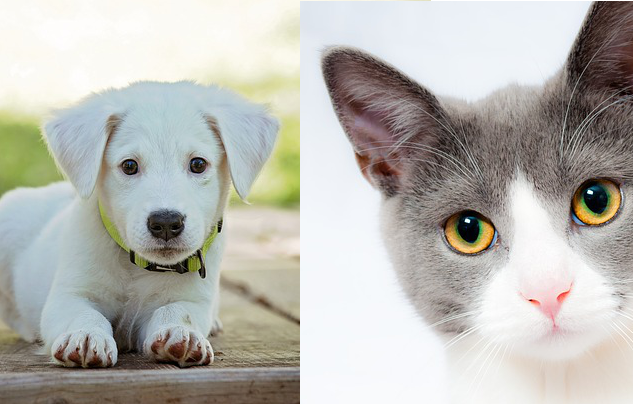 Feature images of the cat and dog from via Pixabay.